During a press conference in Detroit on Thursday, Secretary of Housing and Urban Development Ben Carson appeared to back off from a controversial plan that would have raised rent among the poorest Americans. Talking about the new initiative, Carson said that other funding had come through, so there was no need to increase rent payments, WXYZ-TV reports. According to Carson’s previous line of magical thinking, raising rent would encourage more Americans—specifically, the working poor—to work harder. “The key thing to remember is everything that we’re doing is aimed at elevating people, at giving people an opportunity of removing some of the perverse incentives that have kept people in dependent positions,” Carson said. 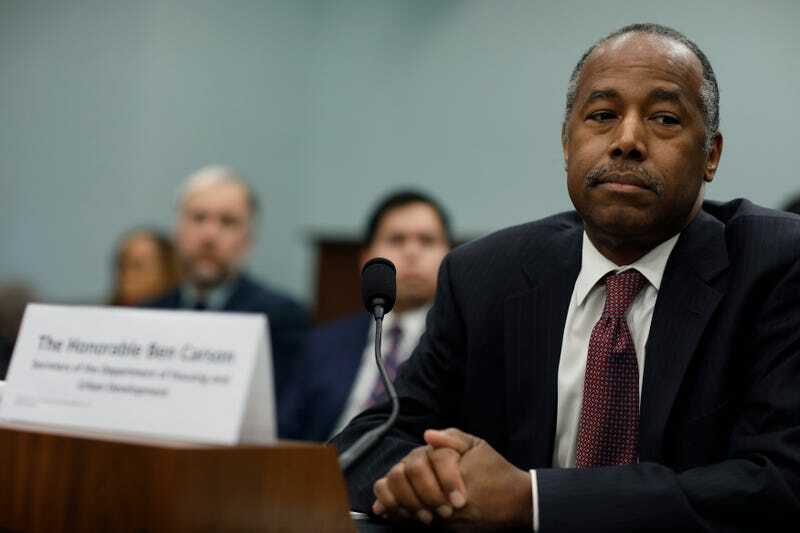 His reversal comes after a new report from the Associated Press found that low-income tenants living in public housing would have to pay around 20 percent more per year under the HUD plan, which was put forward in April. But as many Americans know, wages have not kept up with the cost of housing. As it stands, that 20 percent increase is six times higher than the growth in average hourly earnings. In short, the plan would be devastating for the working poor, who would be stretched even more thinly than they currently are. Ebony Morris, a mother of four living and working in Charleston, S.C., told AP that she saw public housing as a way to get on her feet. “[I could] pay 30 percent of my income and get myself out of debt and eventually become a homeowner,” she said. If Carson’s plan goes into effect, her $403 rent could leap to $600. “This would put us in a homeless state,” Morris said. According to HUD estimates, 2 million households would be immediately affected by the proposal, while another 2 million would see their rent increases gradually phased in over six years. The irony of the “Make Affordable Housing Work Act,” as it was dubbed, is that there is no evidence that incentivizing workers by making them pay more for rent even works. The “Make Affordable Housing Work Act” wouldn’t just increase the percentage of income that tenants have to pay for affordable housing (from 30 percent to 35 percent); it would also allow housing authorities to impose work requirements, and raise the minimum monthly rent from $50 to $150. The proposal would also get rid of deductions for medical and child care, as well as deductions for children living in the home. Right now, a household can deduct $480 per child from its gross income, according to AP, making rent more affordable for working families. It’s unclear how much of the original proposal Carson intends to keep going forward. Perhaps most alarming is how the cumulative effect of Carson’s cruel combination of cuts and increases could fall disproportionately on poor families. Of the estimated 8.3 million people affected by the proposal, AP notes, more than 3 million would be children.